Mouse anti Human CD200 antibody, clone OX-104 recognizes the human CD200 cell surface antigen, also known as OX2. 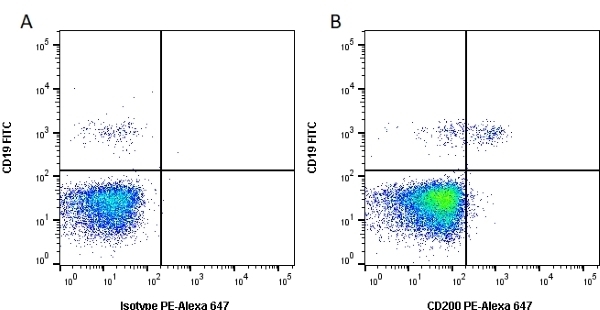 CD200 is expressed by a subset of B lymphocytes, some endothelial cells and by neurons. Studies have suggested that the CD200-CD200 ligand system is of importance in the control of macrophage and granulocyte activation. Koning, N. et al. (2009) Distribution of the immune inhibitory molecules CD200 and CD200R in the normal central nervous system and multiple sclerosis lesions suggests neuron-glia and glia-glia interactions. J Neuropathol Exp Neurol. 68: 159-67. Koning, N. et al. (2007) Downregulation of macrophage inhibitory molecules in multiple sclerosis lesions. Raftery, M.J. et al. (2004) Shaping phenotype, function, and survival of dendritic cells by cytomegalovirus-encoded IL-10. Meuth, S.G. et al. (2008) CNS inflammation and neuronal degeneration is aggravated by impaired CD200-CD200R-mediated macrophage silencing. Yamauchi, K. and Kurosaka, A. (2010) Expression and function of glycogen synthase kinase-3 in human hair follicles. Arch Dermatol Res. 302: 263-70. Kloepper, J.E. et al. (2008) Immunophenotyping of the human bulge region: the quest to define useful in situ markers for human epithelial hair follicle stem cells and their niche. Ohyama, M. et al. (2006) Characterization and isolation of stem cell-enriched human hair follicle bulge cells. J Clin Invest. 116: 249-60. Darmochwal-Kolarz, D. et al. (2013) The expressions of co-stimulatory molecules are altered on putative antigen-presenting cells in cord blood. Am J Reprod Immunol. 69 (2): 180-7. Colmont, C.S. et al. (2013) CD200-expressing human basal cell carcinoma cells initiate tumor growth. Proc Natl Acad Sci U S A. 110 (4): 1434-9. Chen, H.J. et al. (2015) Human placenta-derived adherent cells improve cardiac performance in mice with chronic heart failure. Stem Cells Transl Med. 4 (3): 269-75. Ohyama, M. & Kobayashi, T. (2012) Isolation and characterization of stem cell-enriched human and canine hair follicle keratinocytes. Methods Mol Biol. 879: 389-401. Patel, G.K. et al. (2012) Identification and characterization of tumor-initiating cells in human primary cutaneous squamous cell carcinoma. J Invest Dermatol. 132 (2): 401-9. Exp Dermatol. 17 (7): 592-609.